The Canada Health Act (CHA, federal legislation enacted in 1984) strongly discourages private payment, such as extra billing and user charges, for hospital and physician services covered under Medicare. If provinces allow private payment for such services, the federal government is mandated to withhold an equivalent amount from federal cash transfers. With some exceptions, this threat of financial penalty for failing to comply with the legislation has been effective in restricting extra billing and other user fees. The CHA is silent on where care is delivered. It takes no position on whether health care should be delivered in publicly owned facilities, or private not-for-profit facilities, or private for-profit facilities. Can BC doctors charge patients for hospital and physician care? 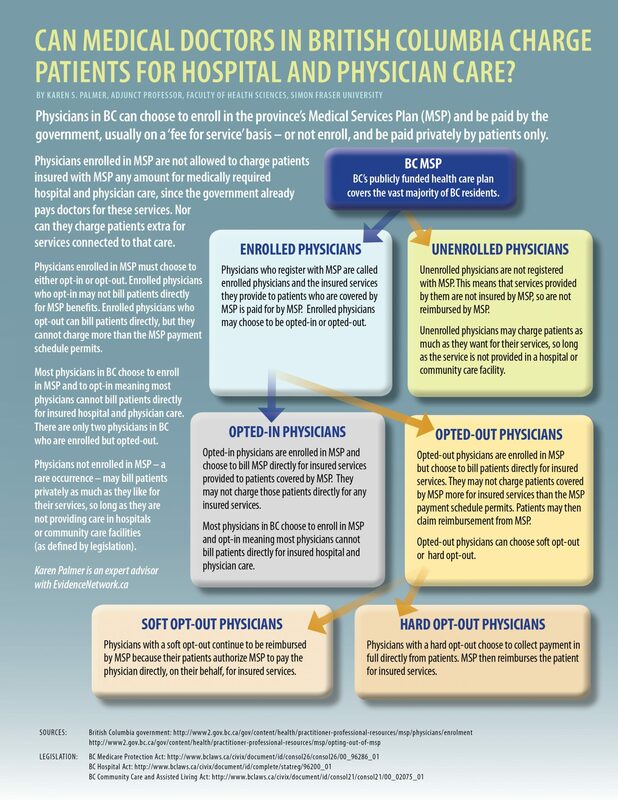 Under BC legislation, physicians enrolled in (and thus being paid by) BC’s Medical Services Plan (MSP) must work entirely within the publicly-funded system when providing medically necessary care, whether that care is provided in hospitals or privately-owned facilities. As long as physicians are enrolled in MSP and opted in, they are prohibited from charging BC residents any fee for, or in relation to, the provision of medically necessary hospital and physician services. Physicians are, however, permitted to completely un-enroll from MSP. Non-enrolled physicians in BC may charge patients whatever amounts they want for providing medically necessary services, so long as those services are not provided in a “hospital” or a “community care facility” (as defined by legislation). Patients are permitted to pay a non-enrolled physician out-of-pocket, but not with private “duplicative” insurance (such insurance — covering the same patients and services as MSP — does not currently exist in BC). Very few BC physicians are non-enrolled in MSP. What’s the court case about? The plaintiffs in this trial — including Cambie Surgeries Corporation and the Specialist Referral Clinic Inc., led by President and CEO Dr. Brian Day — are challenging the prohibition on private billing by enrolled physicians. The plaintiffs allege that the limits on charging patients privately, enshrined in the Canada Health Act and in its equivalent provincial legislation, the BC Medicare Protection Act, infringe patients’ rights to life, liberty, and security of the person under Section 7 of the Canadian Charter of Rights and Freedoms. The essence of the plaintiffs’ claim is that, because the publicly-funded system compels some patients in some jurisdictions to wait for some medically necessary services (in particular, elective surgery and non-urgent specialist appointments), patients should have the right to obtain such services more quickly by paying privately, either out-of-pocket or through private insurance. The plaintiffs seek a system of “dual practice” in which physicians can be paid from both public and private purses, including through private duplicative health insurance covering the same medically required hospital and physician care covered under MSP. Beyond this, the plaintiffs also argue that even physicians still enrolled in MSP should be allowed to “extra bill” patients — through out-of-pocket payment and private insurance — who do not wish to wait their turn for publicly-funded care. The plaintiffs’ rationale is that since BC physicians not enrolled in MSP are already permitted to collect out-of-pocket payments for care delivered outside of hospitals or community care facilities, then private duplicative insurance should also be for sale to BC patients who do not wish to wait for publicly-funded care, even when they are treated by physicians still enrolled in MSP. In sum, the plaintiffs seek to overturn three key provisions of the BC Medicare Protection Act: the prohibition on private duplicative insurance, the limits on extra billing, and the ban on dual practice. Why is the province of BC opposing Day’s position? The defendant in this trial — Attorney General (AG) of BC — will argue against these changes to Medicare, based on evidence affirming that allowing a parallel private payment system, and physician dual practice, and extra-billing in an otherwise publicly-funded health care system, negatively affects these systems. The AG-BC will argue that there is no causal connection between BC’s limits on private payment and the alleged deprivation of life, liberty or security of the person. If the law impeding extra-billing is over-turned, then all physicians would be able to charge patients whatever fees they wished, on top of what physicians are already paid by the government. Instead of care being delivered on the basis of need, as is the case now, overturning the limitations on private payment would result in care being provided first to those who can afford to pay. The AG-BC will argue that care should be delivered on the basis of need, not ability to pay. If the same physicians were to deliver both publicly-funded and privately-funded care (i.e. dual practice), evidence from other countries shows that patients who could afford to pay out-of-pocket or through private insurance would likely get care faster, regardless of their need. When physicians preferentially treat private pay patients, the probable result of a parallel public-private pay system is increased wait times for those unable to pay. The AG-BC will also bring evidence to show that allowing a multi-payer health care system will lure physicians from the public-pay sector to the private-pay sector, potentially reducing the availability, quality, and timeliness of care in the publicly-funded system. It will also argue that a multi-payer health care system that includes private duplicative health insurance will drive up costs, forcing public funders to pay higher prices to “compete” with private insurers. In addition to the plaintiffs and defendants, the Attorney General of Canada is a party in the litigation to protect the Canada Health Act and respond to the constitutional questions raised by the plaintiffs. Intervenors in the trial include the Coalition Intervenors (i.e. BC Health Coalition, Canadian Doctors for Medicare, two patients, and two physicians); Four patient intervenors (supported by BC Nurses Union); and the BC Anesthesiologists’ Society. The trial began in the British Columbia Supreme Court on September 6, 2016.